Look Before You Book A Massage was born April 2, 2018. The idea for this website came about after a group of North Carolina Licensed Massage and Bodywork Therapists (LMBTs) began talking two weeks prior, in response to proposed rule changes by the NC Board of Massage and Bodywork Therapy. The rules are in support of NC SB 548, “An Act to Strengthen Human Trafficking Laws”, which was signed into law in July, 2017. The majority of LMBTs, while supporting the state’s efforts to reduce human trafficking, recognize that the law and its supporting rules will do nothing to stop human trafficking. The criminal activity or trafficking will continue in other ways that will easily affect the public on a larger level. Because we care about the health and well-being of our clients, and want to make sure the public stays safe, we created this website with accompanying public awareness campaign to insure those seeking out massage and other touch services get the quality of care they deserve. We hope to be able to guide you to professional care, so you can be assured you are not unknowingly supporting Human Trafficking with your hard-earned money. For now, we are focusing our efforts on the problem in North Carolina, knowing that just like human trafficking, our efforts will reach beyond state lines. 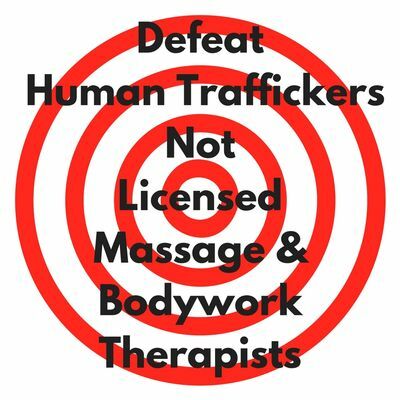 As we get more organized, we will work with other massage & bodywork therapists throughout the country to reduce the instances of illicit businesses taking advantage of the general public. Take a look at the resources on our website and contact us to learn more.